Lake Superior is the largest of the Great Lakes, hence it's name. It is also the largest freshwater lake in the world by surface area. It contains almost 3,000 cubic miles of water, an amount that could fill all the other Great Lakes plus three additional Lake Eries. Lake Superior is also the coldest and deepest (1,332 feet) of the Great Lakes, with an average depth approaching 500 feet. The lake stretches approximately 350 miles from west to east, and 160 miles north to south, with a shoreline 2,800 miles long. The drainage basin encompasses parts of Michigan, Minnesota, Wisconsin and Ontario. Most of the Superior basin is sparsely populated, and heavily forested, with little agriculture because of a cool climate and poor soils. Lake Superior's waters are cold, clear and very deep. This is the perfect environment for Salmon to thrive. The salmon fishery is unparalleled. Chinook salmon, coho and pink salmon are all abundant in Lake Superior. Pink salmon were actually first introduced into Lake Superior and have now spread to all the other great lakes. 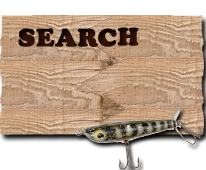 Trolling spoons and salmon plugs in areas with marked fish and nearby baitfish schools is the most common open water fishing tactic. Water flows into the lake from many small rivers and streams providing shore anglers with countless opportunities to tackle these aggressive fish. The Long Lac and Ogoki diversions in Canada, channel water into Lake Superior that would otherwise flow into Hudson Bay. The lake's level is controlled by gates on the St. Marys River at Sault Ste. Marie. Fall fishing for Salmon along the St. Marys river is excellent. Most productive methods include fishing with roe or casting spoons. Lake Superior's drainage basin is rich in natural resources. It is sparsely populated and economically dependent on its natural resources. Many national, state and provincial parks attract tourists to this scenically beautiful area. Trout fishing in Lake Superior is phenomenal! 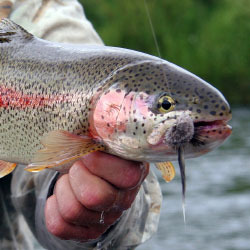 Amoung the most common species are the Rainbow Trout or Steelhead, Brown Trout and Lake Trout. Open water fishing is the same as for salmon, with anglers trolling spoons imitating wounded baitfish. Spring fishing is excellent along the many rivers and streams that drain into the lake. A definite hotspot is the St. Marys River is Sault Ste. Marie. Roe fishing under floats or on bottom are highly productive methods for catching trout this time of year. 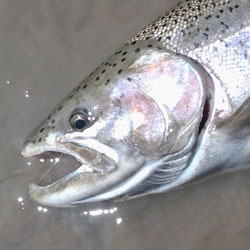 For more information visit Fishing Steelhead. LENGTH: 350 miles / 563 km. BREADTH: 160 miles / 257 km. AVERAGE DEPTH: 483 ft. / 147 m.
MAXIMUM DEPTH: 1,332 ft. / 406 m.
VOLUME: 2,900 cubic miles / 12,100 cubic km. WATER SURFACE AREA: 31,700 sq. miles / 82,100 sq. km. DRAINAGE BASIN AREA: 49,300 sq. miles / 127,700 sq. km. 2,726 miles / 4,385 km. ELEVATION: 600 ft. / 183 m.
Each detailed map provides depth, contours, structure, boat ramps, and updated fishing information. Lake Superior fishing maps also include lake info such as gamefish abundance, forage base, water clarity, weedline depth, bottom composition, complete latitude/longitude grid lines and dozens of GPS waypoints & coordinates.